Between September and December 2015, a total of over 400 institution and school outbreaks of Hand, Foot and Mouth Disease (HFMD) had reportedly occurred, as recorded by Centre for Health Protection in Hong Kong. The high number of outbreaks noted may be related to the simultaneous introduction of students non-immune to enterovirus when the schools opened in the last quarter of the year following Summer Holidays. Hong Kong is divided into 18 districts. 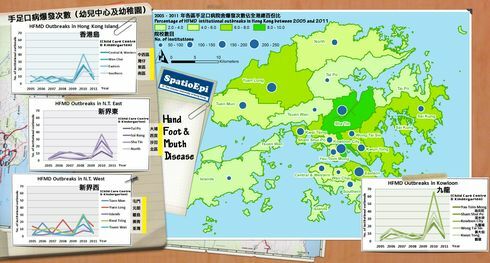 The districts with the highest number of institution and school outbreaks then were Yuen Long and Shatin, each with about 40 – 50 cases. Each district can be further divided into 10 to 37 sub-districts called District Council Constituency Area (DCCA). The map shows the number of outbreaks in the four-month period in each DCCA as differentiated by colour. DCCAs with most outbreaks were Kowloon Tong of Kowloon City District and Chung On of Shatin District, with each having 9 reported outbreaks. Other DCCAs with higher number of outbreaks were Water Street, Stubbs Road, Prince and Yau Yat Tsuen. 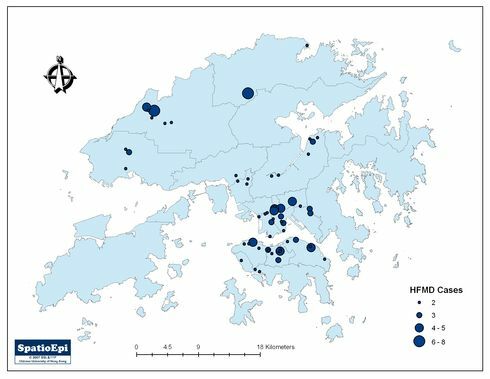 These top outbreak DCCAs were where most schools are located in Hong Kong. The black dots in the map show the geographic locations of schools and kindergartens. Map data were obtained from the Centre for Health Protection of Department of Health and Registration and Electoral Office, Hong Kong Special Administrative Region Government.